Ambassador of Spain to Iraq: Karbala is a model for all Iraqis. Mr. Juan Jose Escobar, the Ambassador of the Kingdom of Spain in Iraq, was honored to visit the al-Abbas's (p) Holy Shrine and med with its Senior Official; his eminence Sayed Ahmad al-Safi, with whom they discussed many matters. 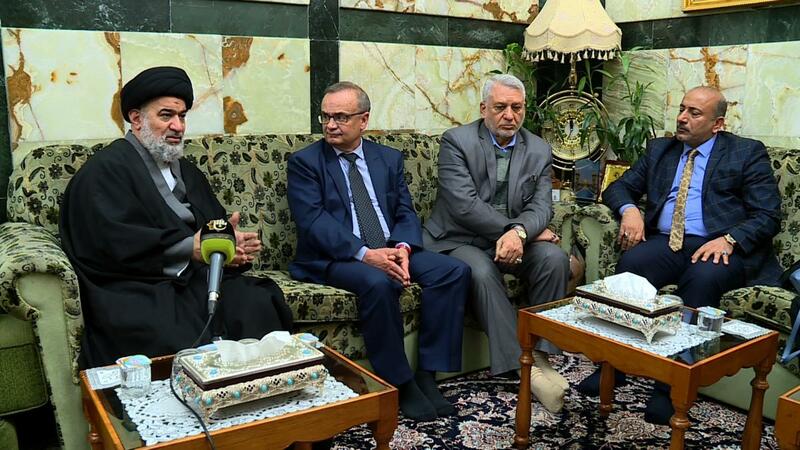 The Ambassador said: "The holy city of Karbala is a model for all Iraqis, and I am very happy to be in this city after visiting the province of Najaf." "The Supreme Religious Authority has a major leadership role in preserving the unity of Iraq and its people, giving its advice to the Iraqi politicians to ensure a bright future for Iraq. Noting that Spain has contributed to defeating the terrorist ISIL gangs, and we look forward to establishing strong economic relations with Iraq in all fields, as we can bring our company to this province for the implementation of investment projects that serve the interests of both parties," said Escobar. Sayed al-Safi told the ambassador after welcoming him: "We hope that this is not the last visit to this city, as Karbala is considered an important Islamic landmark not only for Shiites but for Muslims in general. It became a holy city after the martyrdom of Imam al-Hussayn and his brother Aba al-Fadl (peace be upon both of them), but it was known before that time by being an agricultural land because it is close to an important source of water. It is a beautiful city, but it did not received special attention because of the political situation of the country. And God willing, we hope to develop it in the coming days. " Adding: "Iraq is looking forward to good relations with countries that did not stand against it. Iraq also has many opportunities, whether to invest or to build bridges of good relations with countries, but unfortunately the media is focusing on the terrorist problems, leaving a gap between Iraq and the world. And many of the world's political, economic and social figures are afraid to visit Iraq. The media is always interested in violence, while other things like building and developing the country is absence in the media." Indicating: "The supreme religious authority has played an important role in motivating people to fight the terrorist ISIL gangs, and has been able to protect the country from their evils, and it continues to guide politicians and people to existing problems and how they can be resolved."